Has Earth warmed as much as expected? The argument that "Earth hasn't warmed as much as expected" generally relies on ignoring the factors which have a cooling effect on the Earth's temperatures, and the planet's thermal inertia, which delays the full amount of global warming. When we do the calculations and include all radiative forcings and the amount of heat being absorbed by the oceans, it shows that the Earth has warmed almost exactly as much as we would expect. The argument that "Earth hasn't warmed as much as expected" is a favorite of Dr. Richard Lindzen. Lindzen seems to have first made this argument in a 2002 letter to his local mayor in Newton, Massachusetts. "the impact on the heat budget of the Earth due to the increases in CO2 and other man influenced greenhouse substances has already reached about 75% of what one expects from a doubling of CO2, and the temperature rise seen so far is much less (by a factor of 2-3) than models predict"
In 2005, Lindzen made the same argument in testimony to the UK Parliament House of Lords Economic Affairs Committee. He later repeated the argument on National Public Radio (NPR) in 2006, again on NPR in 2007 in a public debate which included Gavin Schmidt and Michael Crichton, in an Energy&Environment-published paper in 2007, in an article in 2008, another article in 2009, and of course the 2011 article examined in the Case Study and re-published uncritically at WattsUpWithThat and many other "skeptic" media sources. Suffice it to say, Lindzen makes this argument frequently. Lindzen's argument has also been rebutted several times, including by Coby Beck in 2006 and Stefan Rahmstorf in 2008. Let's examine the errors that these rebuttals have uncovered in Lindzen's arguments. "the observed warming is too small compared to what models suggest. Even the fact that the oceans' heat capacity leads to a delay in the response of the surface does not alter this conclusion." "Data from about 1 million ocean temperature profiles show that the ocean has been taking up heat at a rate of 0.6 W/m2 (averaged over the full surface of the Earth) for the period 1993–2003 . This rate must be subtracted from the greenhouse gas forcing of 2.6 W/m2, as actual warming must reflect the net change in heat balance, including the heat flow into the ocean." Rahmstorf references Willis et al. (2004), which found an oceanic warming rate of 0.86 ± 0.12 watts per square meter of ocean. Given that approximately 70% of the Earth's surface is ocean, this becomes approximately 0.6 ± 0.07 watts per square meter (W/m2) of overall ocean heat uptake. Schwartz et al. (2010) put the value at 0.37 ± 0.12 W/m2. For our purposes, we'll put the figure at 0.25 to 0.67 with a most likely value of 0.4 W/m2. Let's keep these numbers in our back pocket and move on to the second neglected factor. "Modelers defend this situation...by arguing that aerosols have cancelled [sic] much of the warming (viz Schwartz et al, 2010)...However, a recent paper (Ramanathan, 2007) points out that aerosols can warm as well as cool"
In short, Lindzen's argument is that the radiative forcing from aerosols is highly uncertain with large error bars, and that they have both cooling (mainly by scattering sunlight and seeding clouds) and warming (mainly by black carbon darkening the Earth's surface and reducing its reflectivity) effects. These points are both accurate. However, neglecting aerosols in calculating how much the planet should have warmed does not account for their uncertainty. On the contrary, this is treating aerosols as if they have zero forcing with zero uncertainty. It's true that aerosols have both cooling and warming effects, but which is larger? In his argument, Lindzen refers us to Ramanathan et al. (2007). This study examined the warming effects of the Asian Brown Cloud and concluded that "atmospheric brown clouds enhanced lower atmospheric solar heating by about 50 per cent." The study also noted that, consistent with Lindzen's claims about the aerosol forcing uncertainty, there is "at least a fourfold uncertainty in the aerosol forcing effect." However, this study focused on the warming effects of black carbon, and did not compare them to the cooling effects of atmospheric aerosols. Figure 1: Global average radiative forcing in 2005 (best estimates and 5 to 95% uncertainty ranges) with respect to 1750. Source (IPCC AR4). Note that Lindzen's assumed zero net aerosol + black carbon forcing is outside of this confidence range; therefore, neglecting its effect cannot be justified. However, since the IPCC provides us with the 95% confidence range of the total net anthropogenic forcing in Figure 1, we can account for the uncertainties which concern Lindzen, and evaluate how much warming we "should have seen" by now. In fact, this is a simple calculation. The IPCC 95% confidence range puts the total net anthropogenic forcing at 0.6 to 2.4 W/m2 (Figure 1). On top of that, as discussed above, ocean heat uptake accounts for between 0.25 and 0.67 W/m2. Therefore, subtracting the ocean heat uptake, the total net anthropogenic forcing over this period is somewhere between -0.07 and 2.15 W/m2, with a most likely value of 1.1 W/m2. A doubling of atmospheric CO2 corresponds to a radiative forcing of 3.7 W/m2, according to the IPCC. Therefore, the net anthropogenic radiative forcing thus far is between approximately 0% and 58% of the forcing associated with a doubling of atmospheric CO2, with a most likely value of 30%. In order to be thorough, we can also include the natural radiative forcings. Most have had approximately zero net effect since 1750, with the exception of the Sun, which has had a forcing of 0.06 to 0.30 W/m2 with a most likely value of 0.12 W/m2 over this period (Figure 1). Therefore, net forcing since 1750 is approximately 0 to 2.45 W/m2, with a most likely value of 1.25 W/m2. Thus the total net forcing thus far is between 0% and 66% of the forcing associated with a doubling of atmospheric CO2, with a most likely value of 34%. What Does This Tell Us About Climate Sensitivity? So far, global surface air temperatures have increased approximately 0.8°C in response to these radiative forcings. Since we're 0% to 66% of the way to the radiative forcing associated with a doubling of atmospheric CO2 (most likely value of 34%), the amount we should expect the planet to warm if CO2 doubles (also known as "climate sensitivity") has a most likely value of 2.4°C, with a minimum of 1.2°C (because of the large aerosol cooling effect uncertainty and the fact that we may only be 0% of the way to the doubled CO2 forcing, we can't place an upper limit on the climate sensivity parameter with this calculation). Using a much wider range of evidence, the IPCC puts the likely climate sensitivity range to a doubling of CO2 at 2 to 4.5°C with a most likely value of 3°C. Our calculation is consistent with IPCC the most likely value. How Much Warming Should We Have Seen? We can also flip the calculation backwards, assuming the IPCC most likely climate sensitivity of 3°C for a doubling of atmospheric CO2 and using the numbers above. In this case, we should have seen from 0% to 66% of 3°C, or about 0 to 2.0°C. Clearly the amount of warming we have seen so far is well within this range. Additionally, the most likely amount of warming is 34% of 3°C, which is 1.0°C. In other words, we have seen very close to the amount of warming that we "should have" seen, according to the IPCC. In short, contrary to Lindzen's claims, the amount of surface warming thus far (0.8°C) is consistent with what we "should have seen" based on the IPCC numbers. Moreover, this calculation puts the most likely climate sensitivity parameter value within the IPCC's stated range, whereas the much lower value claimed in Lindzen and Choi (2009) (less than 1°C for CO2 doubling) is inconsistent even with our calculated climate sensitivity lower bound (1.2°C). For additional discussion of the errors with Lindzen and Choi (2009), see here. When we actually account for thermal inertia and negative forcings, we find that the amount of warming we have seen is consistent with what the IPCC would expect, but inconsistent with Lindzen and Choi 2009. Thus the correct conclusion is that if Lindzen is correct about low climate sensitivity, we should already have seen much less warming than we have seen thus far. Last updated on 5 February 2011 by dana1981. Is there a model that incorporates aerosol and oceanic effects? This is a very common expert skeptic argument. John Christy just used it in testimony to the US House of Representatives earlier this year. No one seemed to have any answer to it. It seems like incorporating these effects into the GCMs would be a normal step. Rovinpiper@1 Practically all modern models include ocean effects and are known as coupled atmosphere-ocean general circulation models (AOGCMs). Practically all modern models incorporate aerosols as well (you can't adequately model 20th century climate without them c.f. "ice age predicted in 70s" canard). Thanks for the reply, Dikran. So are these AOGCMs that incorporate aerosols also failing to explain the relatively low amount of warming that we've seen? If not, why don't mainstream climate scientists simply respond to the claim that, "Earth hasn't warmed nearly as much as the models predicted..." with "That's not true, the model of lead author et al. (year) accurately portrays the warming of the past 35 years." ? Response: [DB] Given that we've just exited the warmest decade on record, which was warmer than the 90s, which was warmer than the 80s, etc, what "relatively low amount of warming" do you refer to? Rovinpiper#3: "failing to explain the relatively low amount of warming that we've seen?" As if that wasn't enough, there are half a dozen other threads on climate sensitivity, which all say the same thing. And a few on predictions made as far back as 1988 which pretty much called it. If you've been paying attention, this isn't news. Hey, muoncounter, do you remember offhand the last month that was cooler than normal? But everything was cooler in the '70s. Thanks for that. That Chevelle pic brought back memories (we had a '71, retrofitted as an emergency response vehicle: 375 engine, glass packs, skid plate, everything...hit the gas & watch the oil companies profits spike on the tach). Betcha that streak continues for some time. Rovinpiper I expect you are referring to the old "no warming since 1998" canard and its variants. Yes, the models do predict there will be occasional periods of a decade or two with little or no warming (or even slight cooling), even in the presence of a long term warming due to e.g. 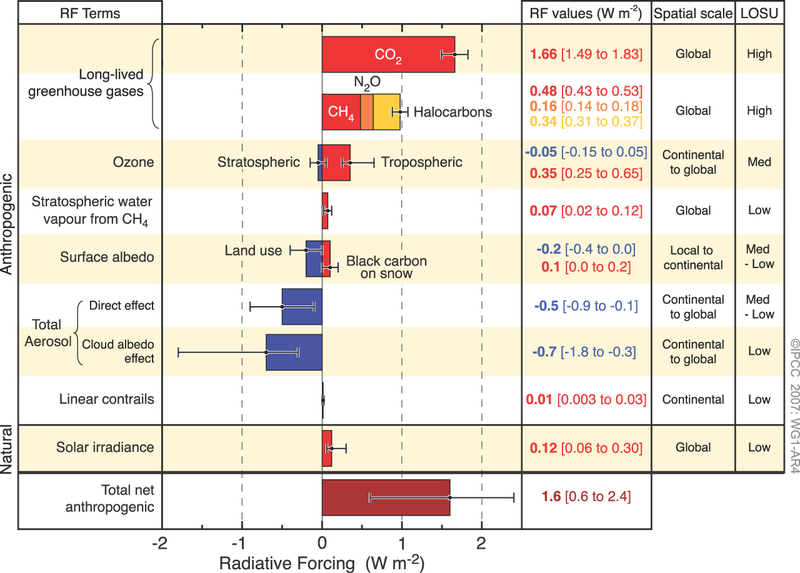 CO2 radiative forcing (i.e. AGW). See the paper by Easterling and Wehner. The models can't predict when this will happen (as it is "weather" rather than "climate") but they clearly do predict that it will happen. Yes, this does get pointed out on a regular basis, but skeptic blogs have a tendency to keep trotting out the same tired canards again and again, even though they have been debunked on a regular basis. Yooper#8: "Betcha that streak continues for some time." Climate central has a graphic about the heat wave last summer showing a probability distribution of temperature. Recent years are most of the outliers high side. It's a cool plot, but it does take a basic understanding of probability to get the message. Response: [DB] Yeah, that's a "cool one"; succinct, yet effective. For more background on past predictions of models and which have come to pass as expected, see http://bartonpaullevenson.com/ModelsReliable.html. Regarding thermal inertia, the executive summary of the IPCC's Chapter 5 that tells us that over the period 1961 to 2003, global ocean temperature has risen by 0.10°C ... but since 2003 there has been some cooling. Sounds to me like the heat build up isn't very much and not very consistent. "but since 2003 there has been some cooling." There has? Please see here especially Von Schuckmann and La Treon. This particular meme needs to be aggressively rejected. Trends are 0.14 C/decade (UAH) and 0.17 C/decade (GIStemp); there is no such cooling. Tamino is far better at this; it would be nice if he updated his graph. The oceans are warming. Over the period 1961 to 2003, global ocean temperature has risen by 0.10°C from the surface to a depth of 700 m. Consistent with the Third Assessment Report (TAR), global ocean heat content (0–3,000 m) has increased during the same period, equivalent to absorbing energy at a rate of 0.21 ± 0.04 W m–2 globally averaged over the Earth’s surface. Two-thirds of this energy is absorbed between the surface and a depth of 700 m. Global ocean heat content observations show considerable interannual and inter-decadal variability superimposed on the longer-term trend. Relative to 1961 to 2003, the period 1993 to 2003 has high rates of warming but since 2003 there has been some cooling. Look at the graph; it's not cooling. It is really not clear what you are trying to say or how it pertains to the post in question. Are you trying to argue that the global temperatures has not warmed as much as expected since 1900 or so? But if you are claiming that, you would have to use a period of time which means that the trend over that cherry-picked time window would not be statistically significant. So a no win for you. Let us deal with your claims about global temperatures first, and then we can address your attempts to argue your case by misinterpreting and cherry-picking the the OHC data. Steve, note the publication date of V&L. Note that it covers 0-2000m and note that covers period with Argo fully deployed. Why was my post deleted? Because I said I was skeptical of the ARGO adjustments? Or some other reason? "The ARGO floats initially reported some cooling. Since then the raw data has been adjusted and now shows warming. I am skeptical of the validity of all that." If you wish to wish to re-post the comment sans offending phrase (or restructure it to comply with the Comments Policy), then please do so. Note that recent literature examines Argo data & finds coverage since 2005 to be the most robust. Then maybe John Cook ought to stop using the term denier. [DB] I originally deleted this due to just being an off-topic drive-by link, but so many of you responded I'm reinstating it. It is considered good form, Steve, to provide more explicative commentary when linking. Please also note that this is waaay off-topic for this thread. Steve Case... Denier is an appropriate and descriptive word. When people are presented with overwhelming evidence and still reject the accepted conclusions of the experts... what are we to call them? They are clearly in denial of the problem. They clearly deny the evidence. They are not the least bit skeptical. They aggressively pounce on every tiny bit of information that might seem to contradict the consensus without applying even minimal research. Regardless of how they might dislike it, I honestly can't think of a more apt term. [DB] Please do continue to engage Steve as long as he stays on-topic, but please do so on one of the more appropriate threads dealing with denial (you know the drill). Lindzen is still pushing his nonsense, this time in a talk at Sandia labs. WUWT is echoing it as well. We're working on a response to that horrid talk, KR. Look for it next week. Unbelievable that Sandia National Labs would even consider entertaining the misinformation from Lindzen or associating themselves with Lindzen who is known for promulgating misinformation. Frankly, I find such behaviour by an academic, from MIT of all places, to be horrendous and unacceptable. Dr. Mike Mann was (needlessly) investigated by PSU based on nothing but false allegations and innuendo, he was of course vindicated. Why is Lindzen not being held accountable by MIT when the evidence against him of misconduct is incontrovertible? Albatross - even worse, Sandia issued a press release with Lindzen's misinformation, for some reason a month after the talk happened. That press release was then picked up and Lindzen's misinformation was spread throughout the interwebs to a much larger audience. Inviting Lindzen to talk was a big enough mistake, but then to issue a press release about it? A month after the fact? Bad move, Sandia. Oh dear, Sandia has a lot of explaining to do, because now they are guilty of promulgating misinformation. Worse, it shows that they were uncritical of Lindzen's claims and opinions. I mean for goodness' sakes-- Sandia labs is affiliated with Lockheed Martin and the U.S. Department of Energy’s National Nuclear Security Administration. How on earth can these organizations, organizations who rely so critically on accuracy and robustness, endorse Lindzen's litany of fallacies and misinformation? I don't recall hearing that he was coming out here. I was on vacation most of June, so I must have missed the talk - I don't even recall seeing an announcement that he was coming. It's rather disappointing that he would've been allowed a venue at SNL given his recent record, especially after having Dr. Santer out (I think last year). But this is a pretty conservative institution with lots of engineers, so I can see it happening. Well, I see that Sandia issued a press release for at least one of their other climate talks (a good one), so maybe it's just their standard practice, and perhaps it took them a while to summarize Lindzen's talk. So perhaps the press release isn't quite as bad as I initially thought. Maybe they're making an example of Lindzen. I'd hate to think they're being "fair and balanced" in representing the science. The climate security material on the Sandia website seems like they get it. 2. the greenhouse gas forcing being partially offset by forcing by increased concentrations of atmospheric aerosols. So aerosols explain some of the predictions-observations discrepancy, but not all of it. jsmith, why do you think that it would be a good idea to expand the article with this particular article? (Especially in light of a critical comment follow-up and more recent papers also critical of methodology). Why do think that one is important rather than the deluge of more recent papers on the subject? Actually, updating the article with this paper (Shindell 2014) looks like a good idea since this enhances our understanding of sensitivity and forcings so that differing estimation methods are reconciled.